Pacific History presents to New Zealand students significant events and issues in Pacific history. Each context includes contested events that have impacted on the people in the Pacific and shaped their place in the modern world. These issues stimulate inquiry and enable students... read full description below. Pacific History presents to New Zealand students significant events and issues in Pacific history. 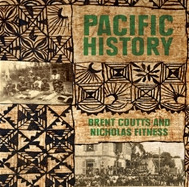 Each context includes contested events that have impacted on the people in the Pacific and shaped their place in the modern world. These issues stimulate inquiry and enable students to achieve excellence. Pacific History contains engaging primary sources, a wide range of activities to engage all learners and historiography. Author Nick Fitness travelled to these islands, met local historians, visited local museums, searched archives and historical sites, to obtain the sources and first-hand information - discovering rarely seen photos and primary documents. Brent Coutts is Head of the Faculty of Social Science at Baradene College of the Sacred Heart. In 2007 he received the Janet Erskine Stuart Award to study non-violent resistance to occupation in the West Bank in Palestine, and in 2009 he was awarded the Royal Society of New Zealand Teaching Fellowship. In 2015 he facilitated a Shared Histories research project to commemorate the First World War between history students in Auckland and Chauny, France, focused on conscientious objectors and those soldiers who refused to fight or mutinied. This project led to an historical exhibition in France and New Zealand, as well as a book being published. In 2017 he was awarded a position on an Asia-NZ Foundation workshop in South Korea. Nicholas Fitness has recently been appointed Deputy Principal at Dannevirke High School. In 2016 he was awarded the Waiheke High School Board of Trustees Scholarship to travel to the Pacific and undertake research for this text. He travelled to museums, archives, historical sites, met local historians and carried out interviews.